Open. The doors were latched back open. On the map it appears in the ground of the Hall, but the hall is out of sight and it just has a few cottages for company, very pretty. The land drops away dramatically down towards the Crouch, and I could see all of North Fambridge and the river below. 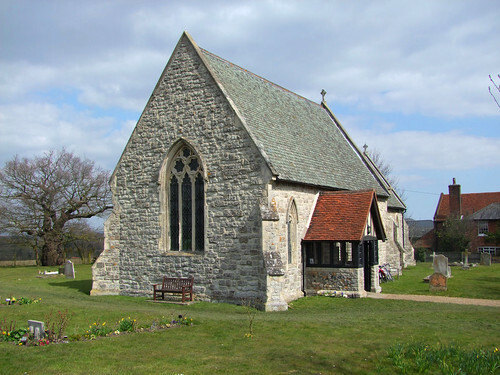 The church was rebuilt in the 1860s out of greenstone, a harsh material more familiar in Kent, although I have visited a couple of Essex churches made out of it, including Goldhanger. An expected 19th century interior of course, but the corbels holding up the roof are very fine, Epsteinesque figures of the apostles with their symbols. A pleasant place to stop. I ate my sandwiches overlooking the view below, and then headed on to Latchingdon.